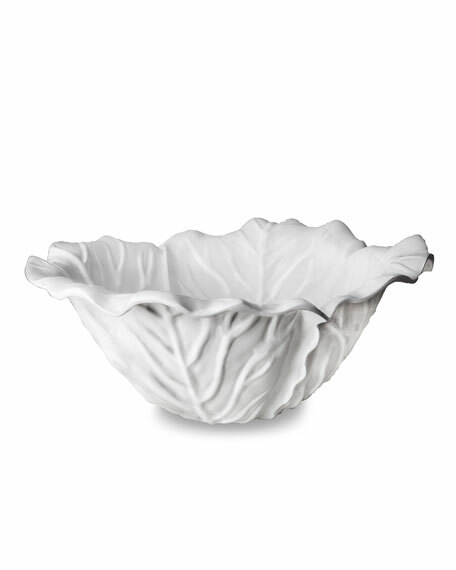 The dramatic Beatriz Ball Lettuce Large Bowl is made up of deeply veined overlapping leaves. Artfully sculpted and cast in luxury melamine, the bowl is the perfect size for entertaining. The brilliant white bowl is great for tossing leafy greens, and is ideal for snacks, too. Melamine is dishwasher safe on top rack. Do not clean with hard or abrasive materials, presoak to remove food residue. Do not put melamine pieces in the microwave or oven. Dishwasher safe (top rack), heavyweight, break resistant and durable, food safe, BPA and PABA free.